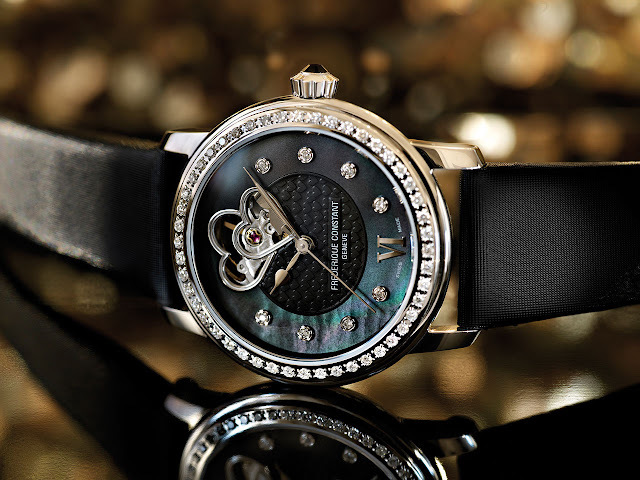 Frédérique Constant presents Black Beauty. This elegant new interpretation in the Heart Beat collection once again lends full significance to the expression, "the movement's beating heart." A hallmark of the brand, two openworked, interlacing hearts in the dial offer a glimpse of the automatic movement. The black mother-of-pearl dial with shimmering blue accents, the diamonds that circle the bezel, and the satin strap add the final touch in reflecting the values and aspirations of women today.